The vocational school in Thurles was set up in 1928 and when North Tipperary VEC was created in 1930 it was the only centre in the north of the county to already have a technical school. The school was located in Castle Avenue. In the early years much of the curriculum was linked to the needs of the local sugar factory however as time went on and enrolment increased other areas were developed. In the 1952 the committee purchased land to train students in farriery, welding and rural engineering. The school was refurbished in the late 1950’s. By 1961, 115 boys were attending six classes while thirty eight girls were partaking in two. By 1965, 187 full time students were enrolled and the department sanctioned the building of two prefabricated classrooms. From the outset the provision in night classes was part of the business of the school. In the early 50’s the night classes expanded with the introduction of a diploma course in social studies. Again in the early 60’s following requests from the sugar factory night classes in languages, mathematics, food hygiene and general science were introduced. By the end of the 60’s a diploma in work study and management was also on offer as well as a rural and social science course. The retirement of Headmaster John O’ Mahoney in January 1971 ended an era for the school. When Seamus Maher succeeded him, he inherited a school that was transformed over the previous four decades. Most importantly, by now the school was running an Intermediate and Leaving certificate course. In the following year, eight students would sit for the Leaving certificate. However, with around 300 day students and 200 evening students attending classes, the facilities were being severely tested. The VEC applied to the department for a new building. After much consideration as to what was best for Thurles the department sanctioned a new building in May 1975. In autumn 1981 the new vocational school at Castlemeadows – Gairm Scoil Mhuire – finally opened. The building cost £1.25 million. By 1988-9 the total day enrolment was 423 students. When Antóin Ó Briain succeeded Séamus Maher as principal two years later, the school was running instruction for seventeen classes with twelve subjects in junior cycle and seventeen in senior cycle. Furthermore, a new business administration course had been organised. Night classes continued to prosper with outreach programmes from the IPA and St Patricks College Maynooth being run through the school. Sa bhliain 1998 bunaíodh Gaelcholáiste na Siúire mar Aonad Lán-Ghaeilge i nGairmscoil Mhuire i nDurlas Éile. Bhí Gaelscoil Bhríde ar an bhfód le cúpla bliain agus bhí oideachas dara leibhéal trí mheán na Gaeilge ag teastáil ó thuistí agus ó dhaltaí sa cheantar. Tháinig lucht na Gaeilge le chéile agus bhuail siad le Lúcás Ó Muircheartaigh – Príomh-Fheidhmeannach an Choiste Ghairmoideachais, le Príomhoide agus le Bainistíocht na Scoile agus deineadh cinneadh Aonad faoi leith a bhunú sa scoil. Ceapadh Seosaimhín Ní Chathail mar Mhuinteoir i bhfeighil ar an Aonad agus ag an am céanna ceapadh Séan Ó Donnchú mar mhúinteoir i bhfeighil ar Ghaelcholáiste an Aonaigh.Bhí rath ar anAonad fad a mhair sí ar feadh tréimhse ó 1998 go 2012 . Deineadh cinneadh deireadh a chur leis antogra ansin agus béim a chur ar an Máthairscoil. In 1999, Fiona O Sullivan became the new principal. In 2007/8 the new canteen and the school gymnasium (the Dome) was opened. The Dome was a joint venture between the GAA and North Tipperary VEC. In 2009, the school was officially renamed Coláiste Mhuire Co-Ed. Denis Quinn became principal in 2012. Tipperary Education and Training Board (ETB) is one of 16 ETBs established under the Education and Training Boards Act 2013. The introduction of this legislation in 2013 saw both North Tipperary Vocational Education Committee and South Tipperary Vocational Education Committee amalgamate to become one Education and Training Board (ETB). 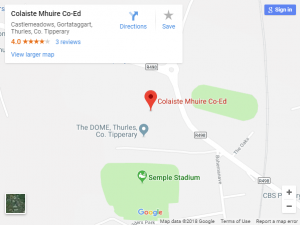 Coláiste Mhuire Co-Ed operates under the ageis of Tipperary Education and Traning Board.